Do you have spring fever? I think I do, I’ve been in a bit of the doldrums with our crazy weather; cold and snowy one day, bright and 79° the next. One day I am cleaning and purging like a crazy woman, the next I am sitting by the fire reading a good book, watching dust bunnies collect. Don’t get me wrong, I love weather, all sorts, but lately it seems to be wreaking havoc on my body with allergies and zapping my energy. So I thought as much as spring seems to be springing, it still feels like the right time to give you this lovely, bright, warming and simple soup. This easy recipe is loaded with chicken and veggies, a little rice and adorned with the brightest green avocado, salty queso fresco, crunchy tortilla chips, a touch of cilantro, and finished with a tangy squeeze of lime. What I love about this soup is that it can be both quick or slow, if needed. Ready in under 30 minutes if you are in a hurry or put it together in the morning and toss in the slow cooker and dinner will be ready when you get home. TIP | One thing I’ve learned about chicken and the slow cooker is that you need not cook it so very long lest it get tough. 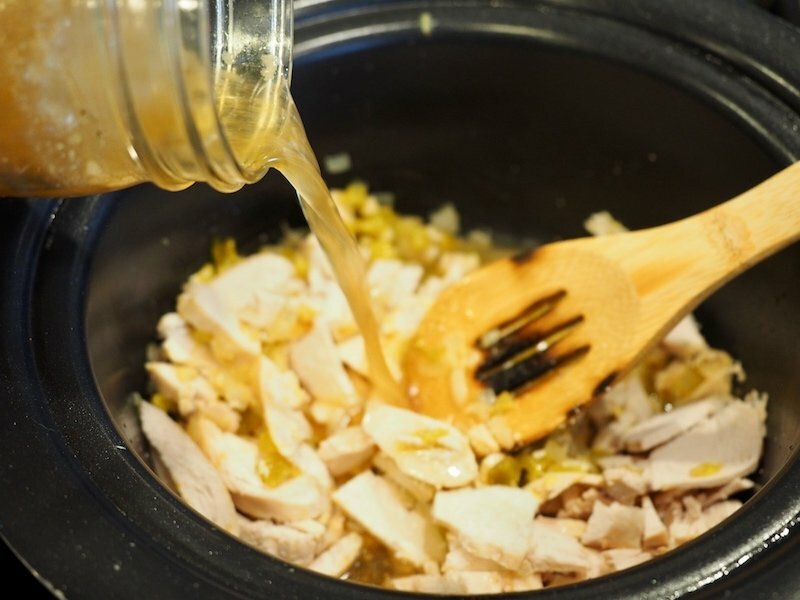 So if you need to put it in the crockpot all day long, place your chicken in frozen and uncooked, add all the other ingredients and set on low for 8 hours, then shred it before serving. 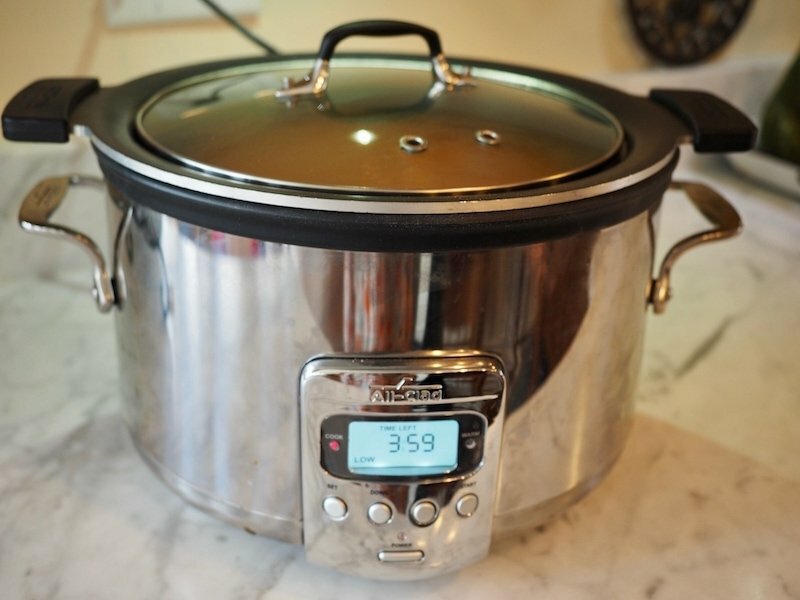 If you have the luxury of being around sooner, place your cooked chicken in bite size pieces in the crockpot and place on low for 4 hours, then set to warm. This is how I made it most recently. Pour a little olive oil and a pat of butter, saute your onions until translucent and golden. 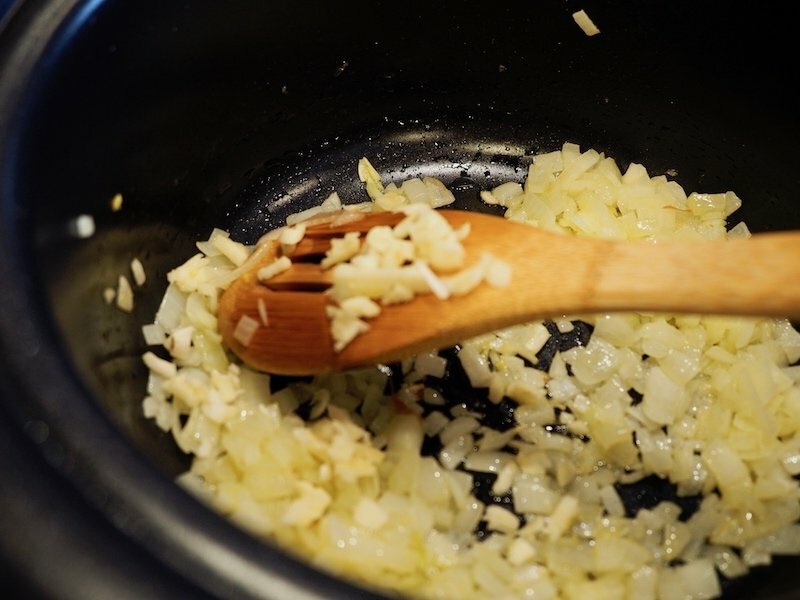 Add your garlic at the last minute or two of your onions sauteing. 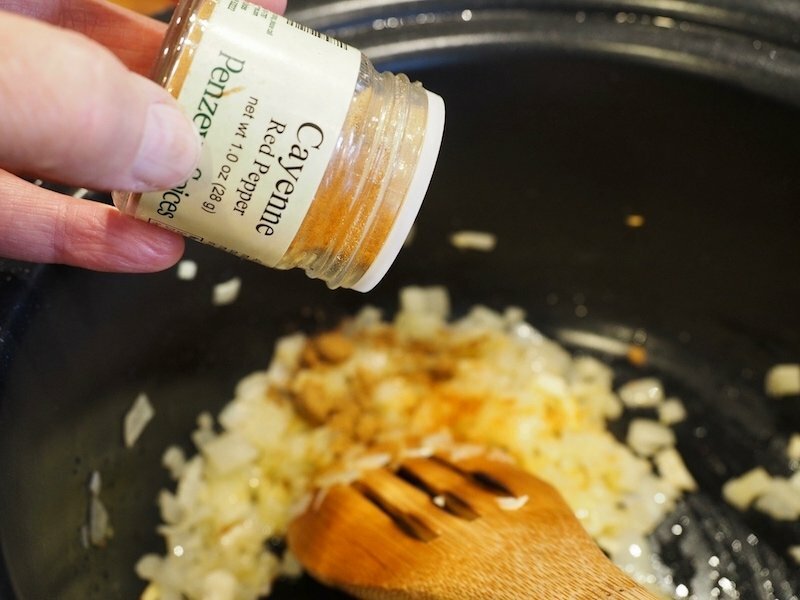 A dash (or more) of cayenne pepper, stir it around to bloom your spices a bit. 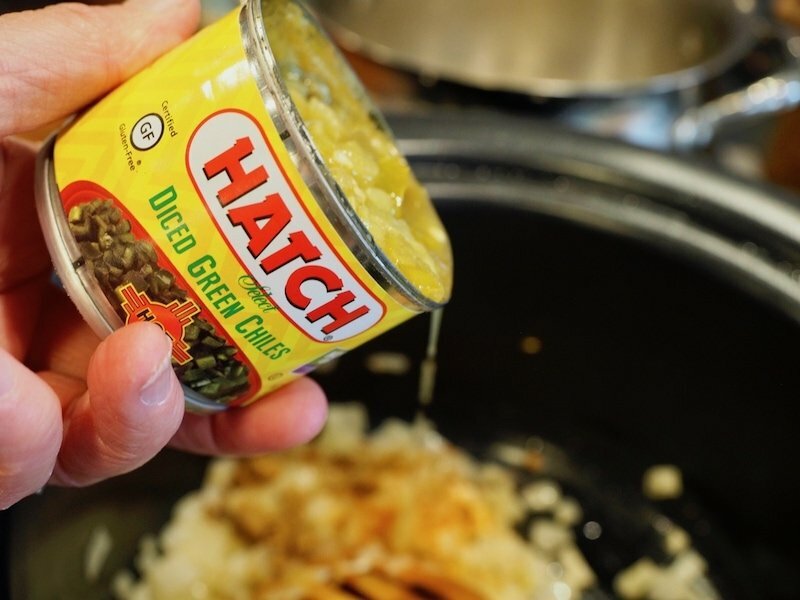 Now dump in your diced green chilis, no need to drain. And your chicken, give it a good stir mixing those delightful spices in with the chicken and goodies. Pour in your chicken stock, I used my homemade bone broth, just replace the beef bones with a chicken carcass, or wings and feet. Psst, boxed chicken stock is just fine, I know homemade is better for you, but…sometimes boxed is just fine! 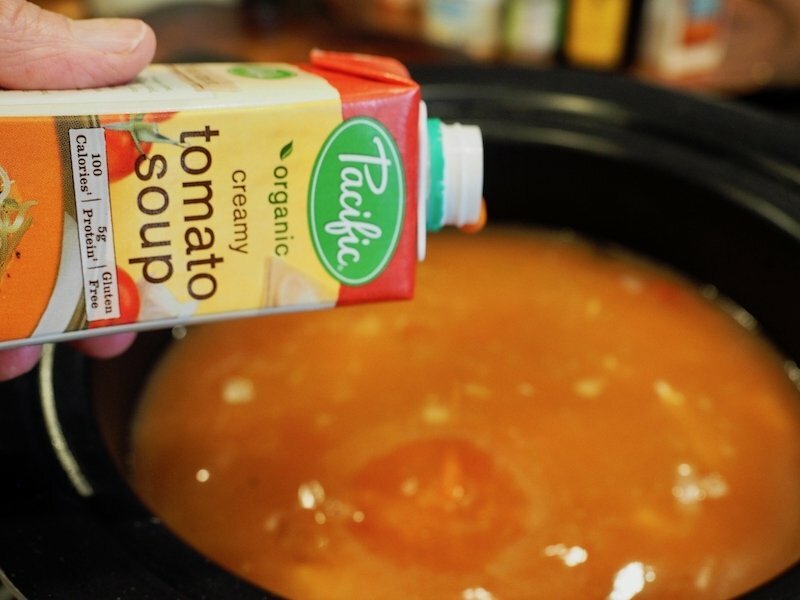 This is optional, but I like the body it gives the soup, pour in a small single serving carton of tomato soup, or a can of condensed tomato soup. Give it all a good stir and if you are eating it right away*, add in your corn and rice. 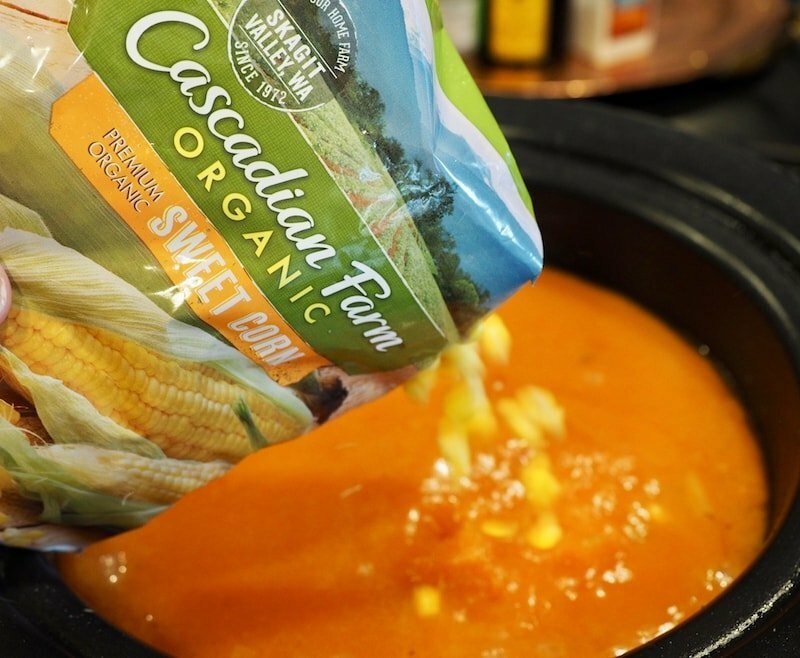 *If you’ve placed your soup in a slow cooker, wait 15-30 minutes before serving to add the corn and rice. If desired, add some cooked rice. I typically make extra rice and freeze it to use in recipes just like this. 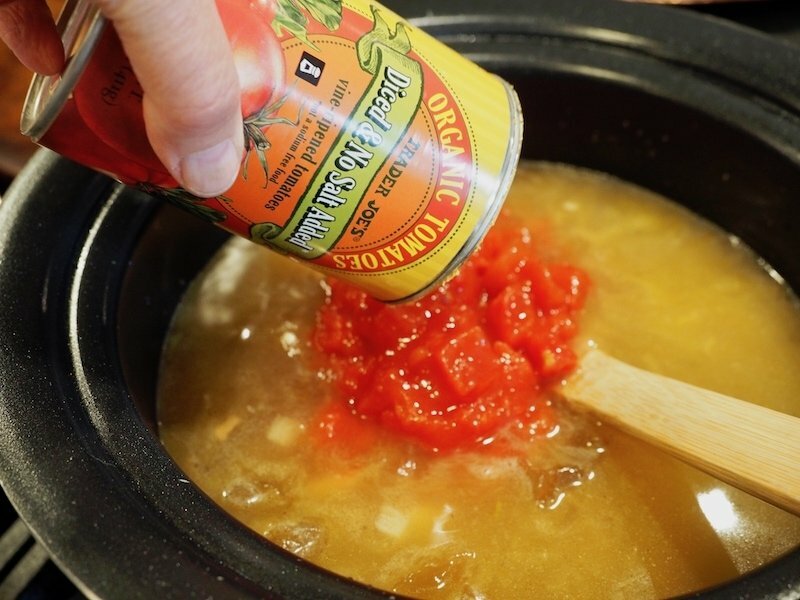 Simmer for 25-30 minutes or place the soup in a slow cooker and turn on low for 4-8 hours depending on when you need it ready. See notes for slow-cooker instructions. 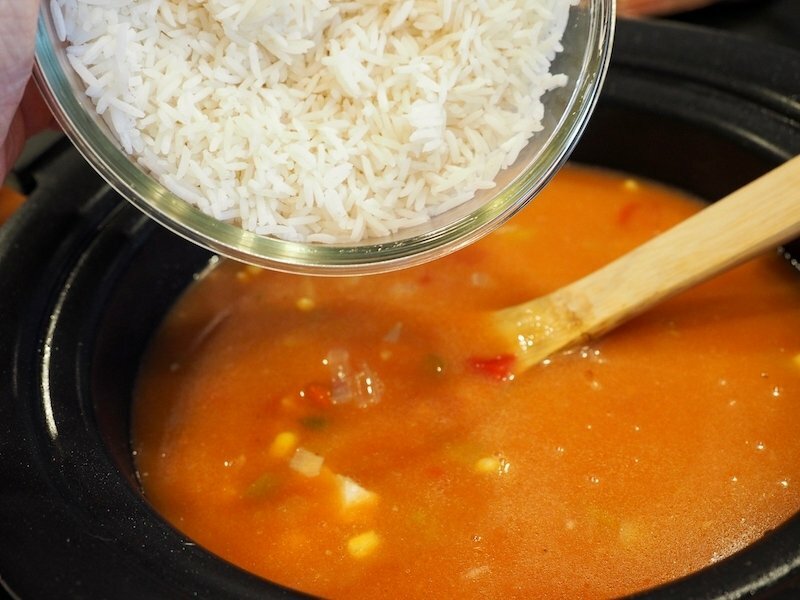 Once you are ready to eat the soup, if you haven’t added it, add your corn and rice if desired. 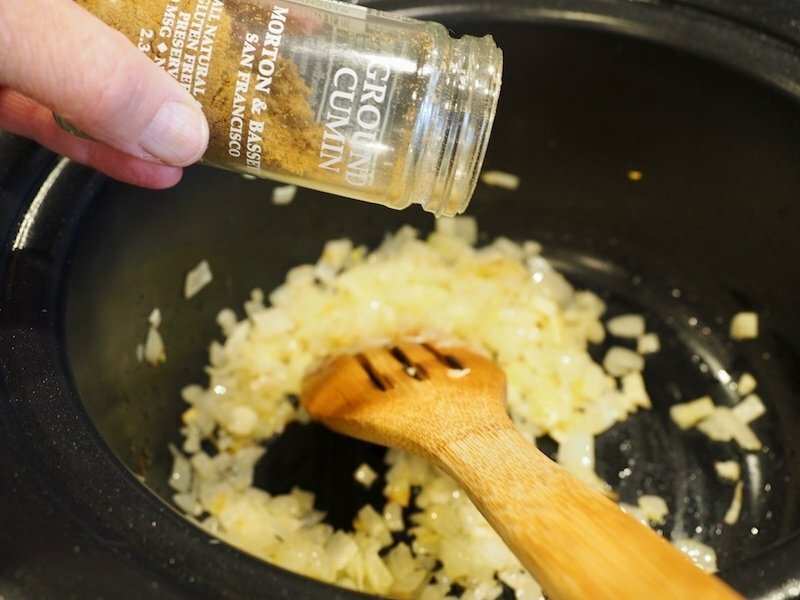 Adjust seasonings if needed, adding a little salt and pepper to taste. Just before serving, squeeze in your lime juice and chopped cilantro and stir to combine. Sliced jalapenos or a splash of Tabasco sauce. 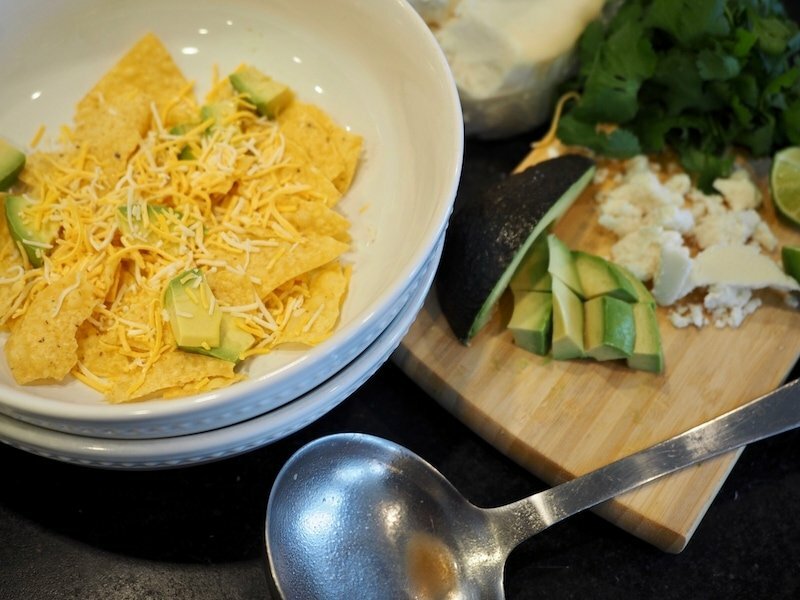 Serve with a few more tortillas chips, a sprinkle of cheese, a couple more avocado chunks, a squeeze of lime, and finish it all off with a little fresh cilantro. 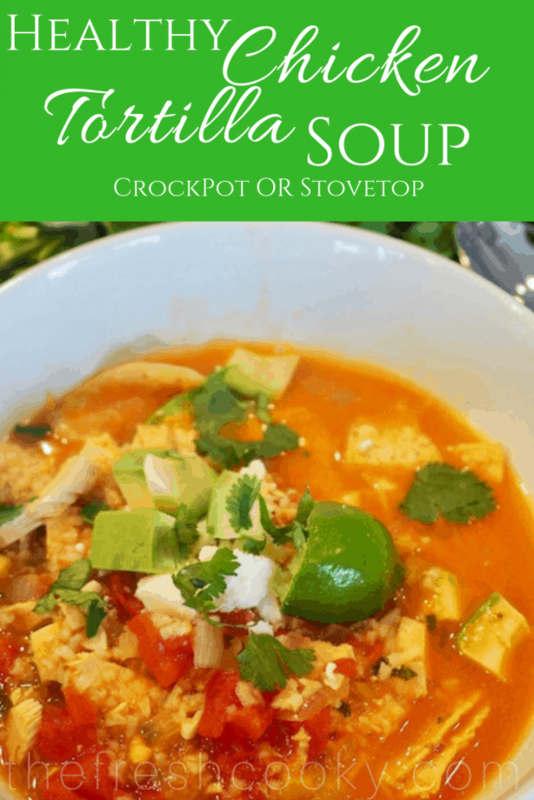 This recipe for tortilla soup is loaded with chicken and veggies, a little rice and adorned with the brightest green avocado, salty queso fresco, crunchy tortilla chips, a touch of cilantro, and finished with a squeeze of lime. 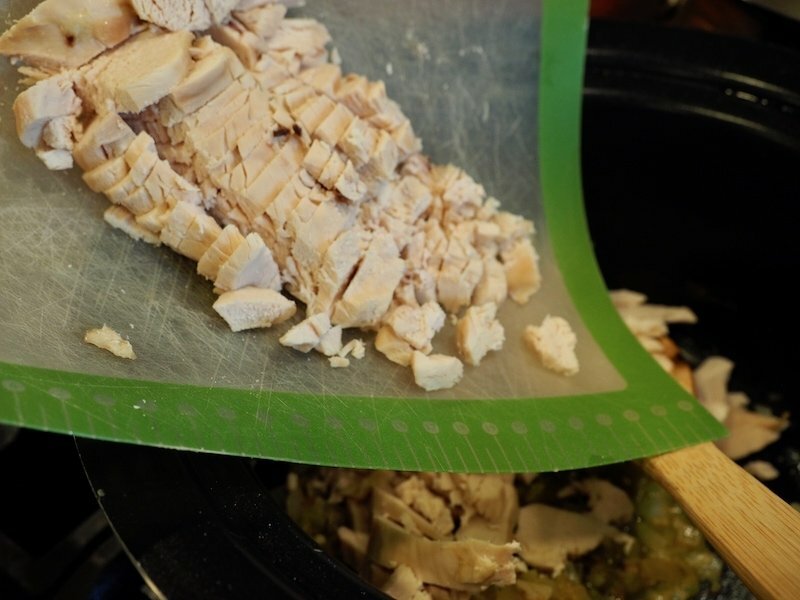 If using uncooked chicken; rinse chicken and cover with water, cook until tender about 10-12 minutes, shred or dice. Or use leftover turkey or a rotisserie chicken, about 2 cups worth, shredded or diced. Heat a medium pot over medium heat, pour in olive oil and butter. Toss in minced onions and saute until translucent and golden (6-7 minutes), in the last minute or so toss in the minced garlic, saute for 1 minute. Add in spices and saute for 1 minute. Toss in canned chilies, diced tomatoes, diced chicken and chicken broth. Stir and bring to simmer. If adding corn and rice, add at the end, simmer additional 4 minutes or so. Before serving stir in lime juice and cilantro. 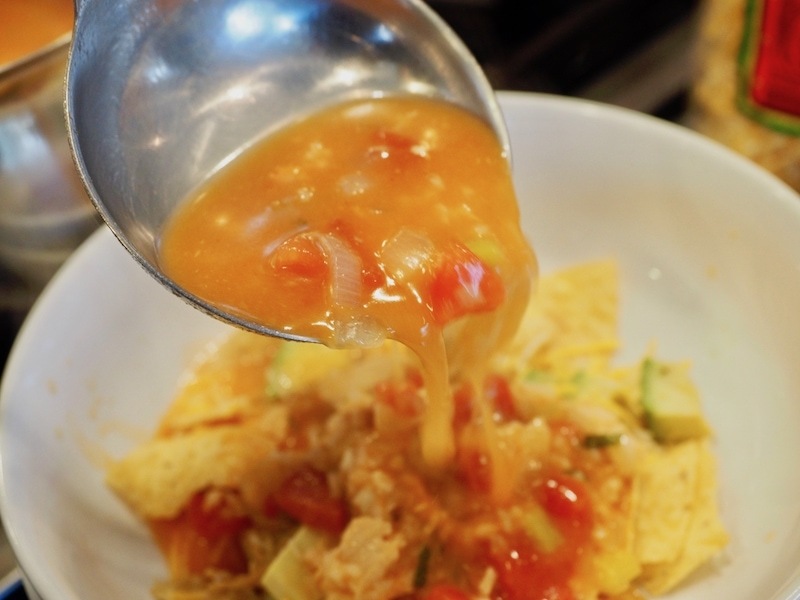 Serve hot over crushed tortilla chips, crumbled or shredded cheese, avocado chunks and a squeeze of fresh lime. 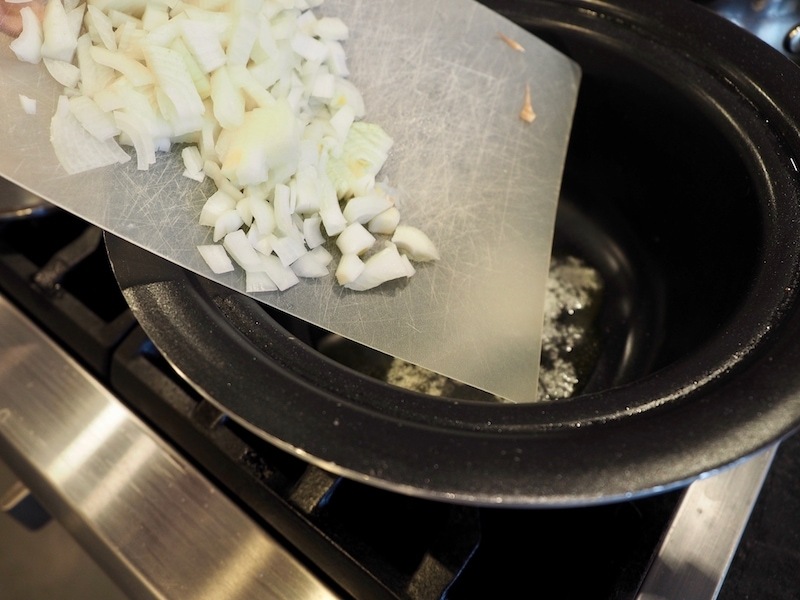 SLOW COOKER INSTRUCTIONS | If you have all day, saute your onions and garlic, then add all other ingredients to a slow cooker, including chicken (raw or frozen is fine if you have at least 8 hours) make sure your chicken is cooked if you have 4 hours or less). Shred chicken and add corn, rice, lime juice and cilantro just before serving. 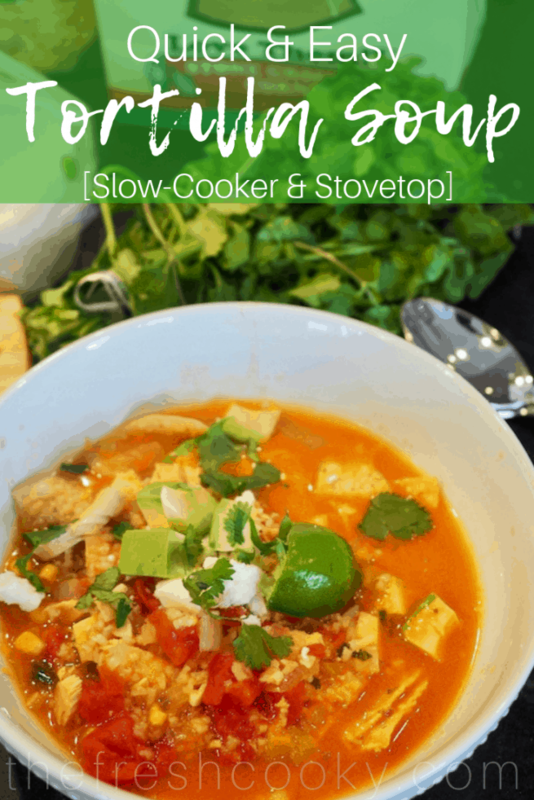 © 2018 | This recipe for Easy Tortilla Soup was featured first on The Fresh Cooky. Live this one! We tried it tonight! Wahoo!! So glad you did Ledia!! ? Made this last night, it was so yummy! Even my husband loved it and he doesn’t really like soup! Thank you Kimberly, so glad to hear your family enjoyed this soup! It’s a chilly day winner that’s for sure!